A Prosodic Odyssey: Sonnets from page to stage. A Commonplace Blog on Sh. by WS. Open 24.7.365. Click on the BUY NOW button and it will take you to our PAYPAL account. Place your order and it will be shipped within 2 days. We have satisfied customers from California to Glasgow. We have a run of 750 sonnetbooks. and signed by William S.
i.e. 1/750 WS. 2/750 WS. etc. HERE’s why you’ll want to get YOUR copy. SIMPLE EASY typeface and POCKET SIZE. (plus shipping to UK, EUROPE + USA/CANADA). Buying more than one book REDUCES the shipping cost. 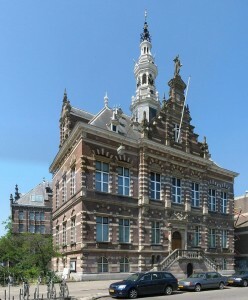 the Koninklijke Bibliotheek in the Netherlands. in a very easy to use book. The new edition is the same handy A6 size with a heavy-duty spiral binding. The paper weighs 200g; so thick, tear-proof, and durable. The book totals 81 pages with flexible transparent covers. These books, like the poems, are built to last. Shakespeare for the next generation. Wouldn’t that be nice? To be an influence for the good where Shakespeare is concerned. It’s not about us, it’s about him. All in a non-bardolatrous mold. 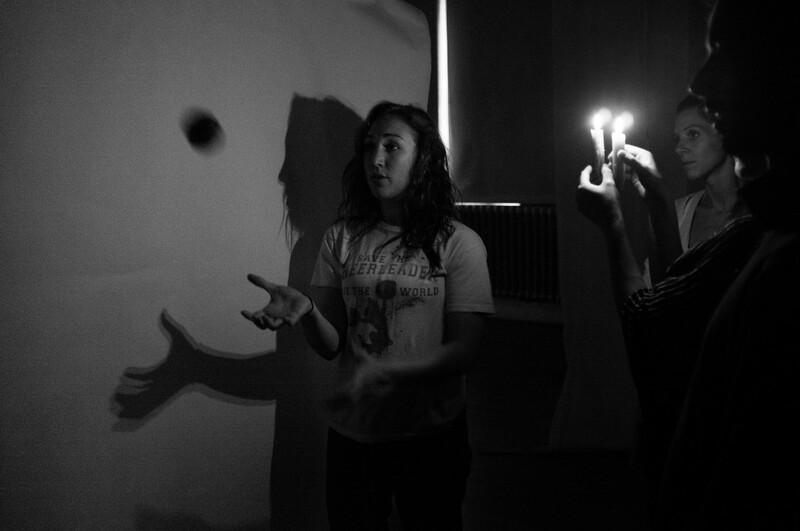 There’s another Workshop 27th in Jerwood Space happening at the end of september. There are few shows in a performer’s life that stand out. 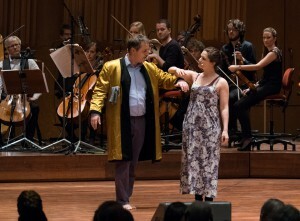 Mine happened in january 2015 Blog post on Pericles at the Berwaldhallen in Stockholm. Pericles the play. There are photos below and that video that gives a sense of how amazing it was. We wrote of it OP Pericles earlier this year. That isn’t what made it stand out. The day after performing and celebrating til early, we left to go back to our respective homes. We hit the airport mid afternoon and i was buzzing and full of the night before, humming the score and massively pleased with myself. My partner Sassy is far more grounded than I and tagged along putting up with uber-thespian’s enthrallment to the post-show glow. I hit the loos just before security and coming back Sassy told me she’d seen a man who was wearing a shirt that looked like a member of the music ensemble from the night before. I didn’t hear the looked like and started to assume everyone around me was a member of the ensemble. By this time we’re approaching security and taking off shoes and belts. I’m scanning the crowd around me looking for the ensemble members. Sassy repeatedly telling me i was mistaken, but I’m hearing nothing, except the voices and music in my head of our shared experience. As soon as i said it, i knew it was wrong. Me, in suit and cashmere overcoat with a gold lining, pointing at a random Scandinavian businessman whilst his friends shocked responses started already to make this guy’s life a living hell. Being the consummate professional and performer I ignored all of that, turned on my heels and walked assuredly away. Sassy practically bounced from stifling and holding in her laughter. The rest of the flight and the whole year since has made this story family legend. The King in his coat. The fool inside it. Here’s an impression of what it looked like. Crimson Tempest. What do you see? What do you know? Perhaps you know it appears in Shakespeare’s play The Tragedy of Richard 2nd. We interrupt this blog for promotional purposes. 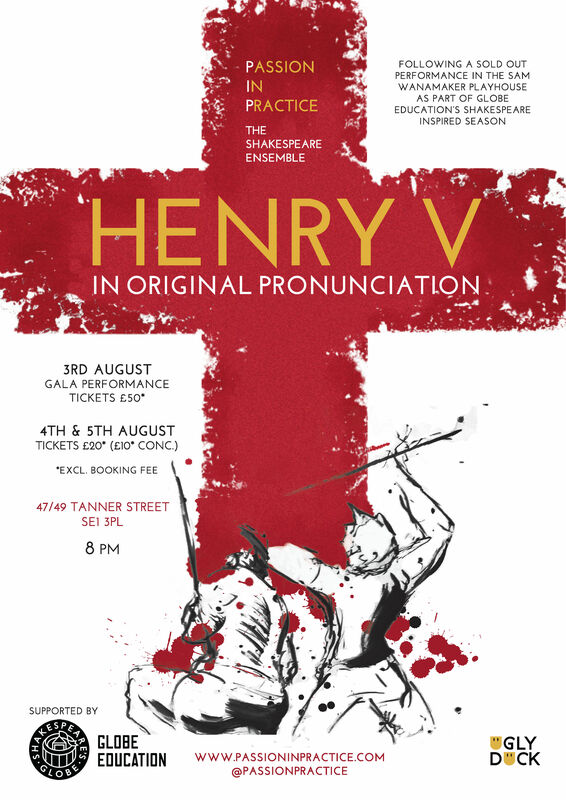 Our primary purpose of this post selling tickets to a production of Henry V at Tanner St.
they use the code word concession when booking online. Now back to our regular posting. Delivery of text continues to be a deciding factor in good Shakespeare. What does that take? Too forced and you lose. The Shakespeare voice appears. Too disconnected from physicality and you lose. The Shakespeare voice wins. Too. Many. Pauses. The Shakespeare voice bores. Text is physicality. The smallest unit of sound, the phoneme, requires effort. There is a literal physical journey of the words on the page arriving on the stage. The punctuation dictates the shape of the thought. Thoughts contribute to ideas. triple checks with modern editions and returns to the text as given. Questioning everything; whether it be spelling, italicisation, or capitalisation. Accept and or reject based on exploration and expediency of the characters. Our own cherished thoughts and ideas aren’t infallible. 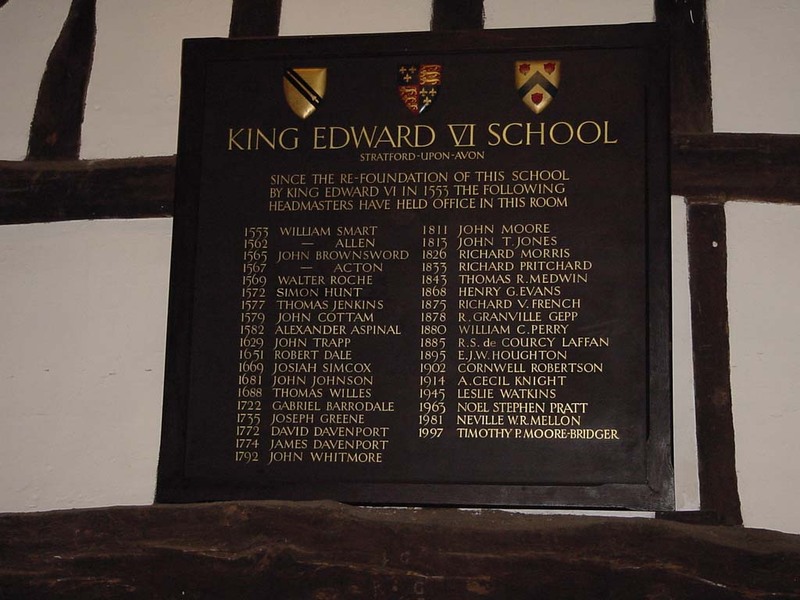 about where Henry V sits in relation to the entire corpus of 544 extant Early Modern plays. Then in relation to the corpus of Shakespeare’s 38 (!) Tragedies, Comedies and Histories. The mind steering them contributes more to their acceptance. Shakespeare’s most average play? funniest scene? Examining the sets of data lead some in one direction, others in another. 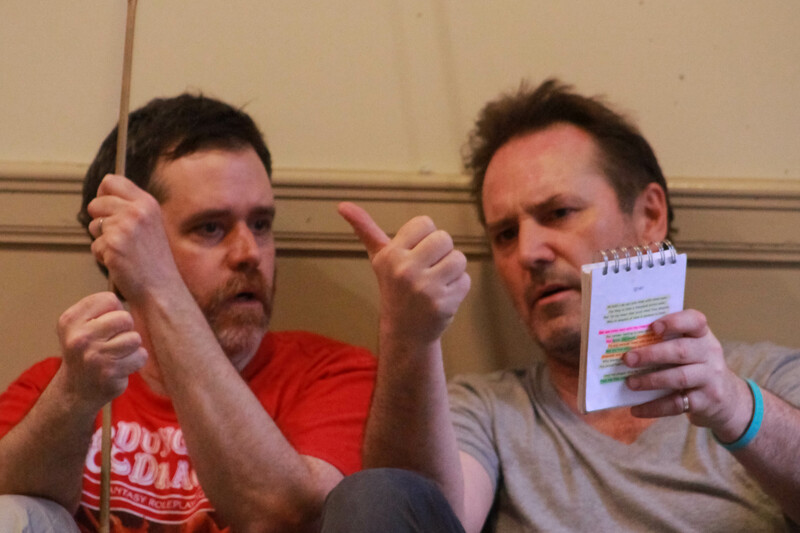 The casting of a production selects the guiding individual actor minds. 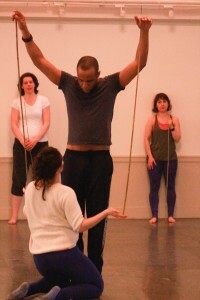 The crossroads of physicality and thought employs the actors skills. Our Ben excels in choosing an ensemble. Script analysis is a tool we use. 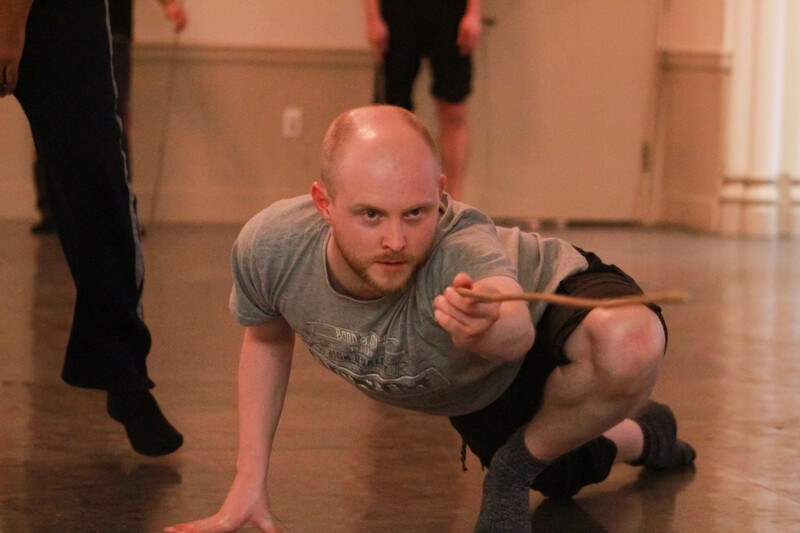 Character exploration happens unspoken with stick work. Being wrong never feels good. Being judged less so. Justification follows. all occur after the fact. 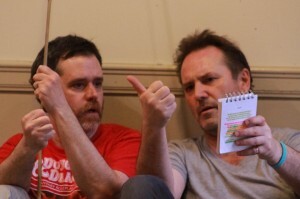 and do what we do (Colin Hurley joined in, Matt Mellalieu picked up my roles). perform at Tanner Street Studios. Tickets are still available. 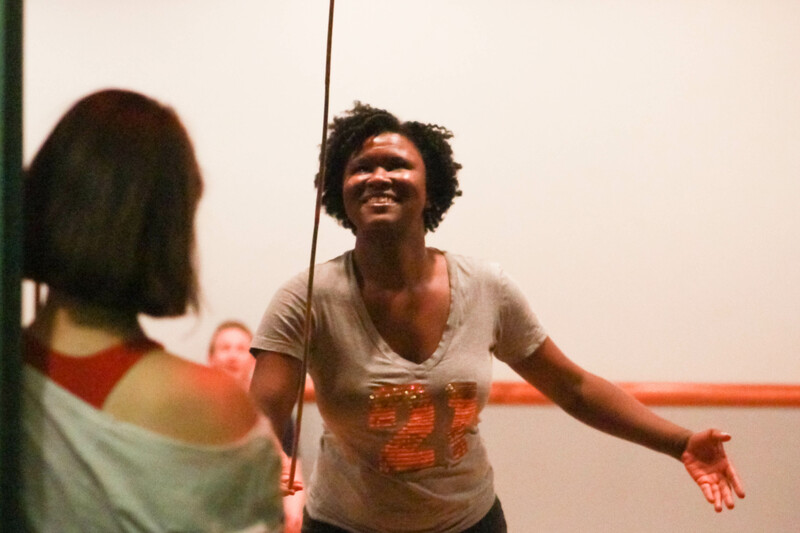 Go experience a rich vein of Shakespearean work being mined. And the production is cut to David Crystal on Henry V in OP 2 hours traffic of the stage. And these actors have learned their lines by heart within two weeks. And there are some textual additions from the earlier plays in the 1st tetralogy. Thanks to Patrick Spottiswoode from Globe education. Also Clare and our two minders, Aidan and Alice. showing that London is as international as it ever was. and the buck basket scene from Merry Wives of Windsor. 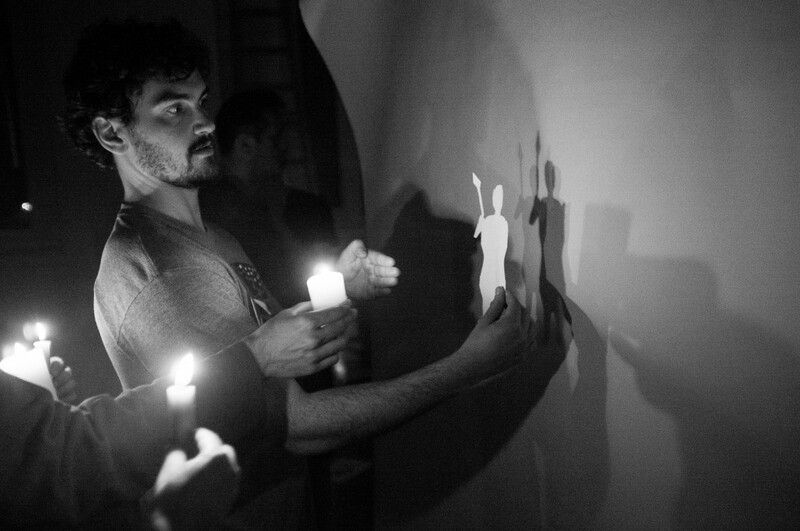 Shadows at Sam Wanamaker Playhouse. Things change in the shadow world. Fear meets awareness, the imagined becomes real. Paper cutouts make an army. Candles cast shadows. Lots of them. Lights are brighter than candles. They too obscure. 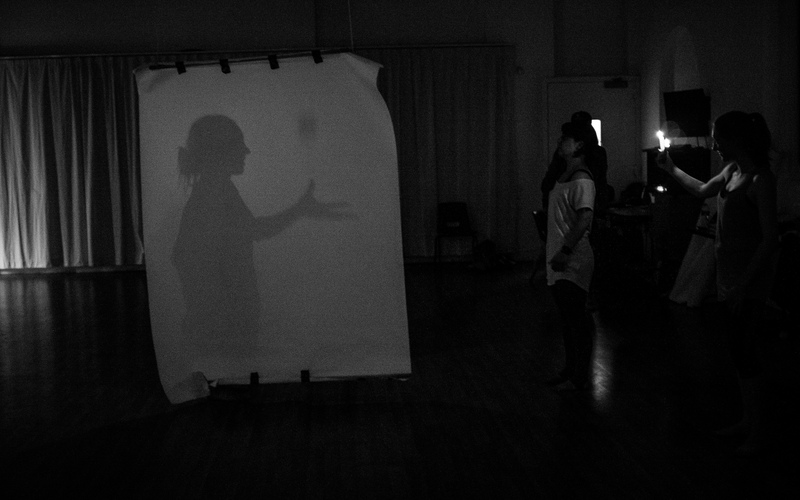 The rehearsal process is a shadow of the final show. Topping and tailing a shadow of rehearsal. The pit, the deck and the balcony are fully explored. Straight lines turned to curves. Actors now characters shaped by cue scripts and walking with sticks. Push, pull, resist and yield. Henry the Fift in OP at SWP. That’s the Sam Wanamaker Playhouse. The indoor space at the Globe theatre, the lovechild of American actor Sam Wanamaker. How fitting that Ben Crystal is utilising a cast of Americans, Brits, Europeans, Indians and a Grenadian all talking in OP. 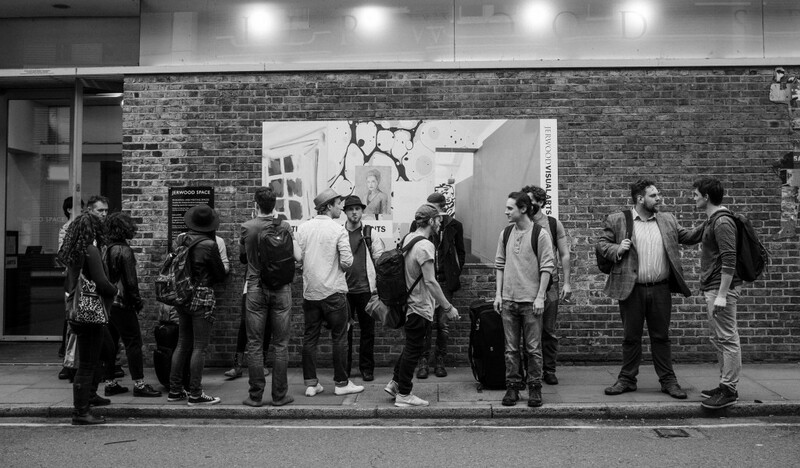 Three days ago we gathered as 21 actors and 5 production crew in the Jerwood Space. The Passion in Practice Ensemble new configuration sports an ethos of exploration, despite time being short. Tomorrow we present an evening in OP. 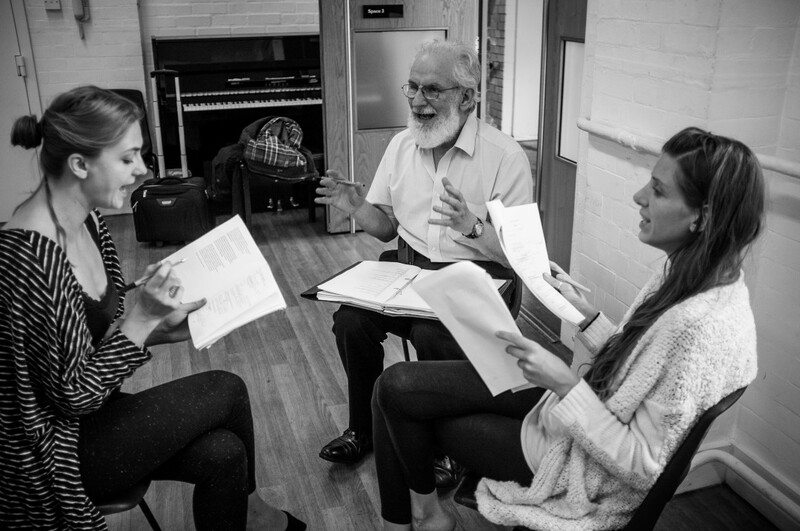 David Crystal our Master of Pronunciation reviewed our efforts today. Father and son have completely differing approaches to the whole OP process. Ben pushes the ensemble work from within whilst father builds a scholarly frame. Henry V presents several aspects for engagement. OP French? Welsh? Scots? Irish? Here our Master of Verse coaches a Lithuanian and an Austrian in their French parts. Ensemble meets daily from 9am-6pm and sometimes David Hywel Baynes 401 photography one of our members, brings in a camera. These last two days we worked into the evening for shadow work. 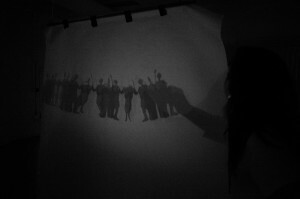 Rather shadow play. Ensemble is treated to the supple warrior Phil. Ensemble sweats and collects muscle aches and pains. Ensemble learns new things daily. Ensemble has fun. (Can’t stress that bit enough). 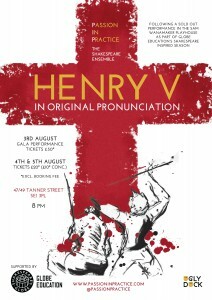 Ensemble will be performing Henry V at the SWP on the 26th july. It is sold out. 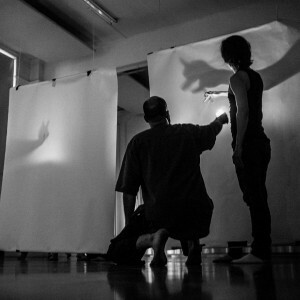 If you want to see this exploratory production in Original Pronunciation and 21stC Original Practice attend at Tanner Street. Shortest Sonnets marathon in history? A Scotsman of my acquaintance pointed out we recited his 154 sonnets on his 451st birthday i.e. 154-451 or 451-154. How cool is that? Shakespeare as cool. That would be scanned. Take this marathon idea. 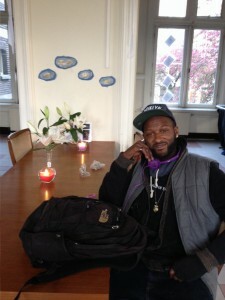 A week beforehand, we planned to simply do a birthday SHAOKE session with Devon Glover aka the Sonnetman from NYC, who happened to be in NL thanks to the US embassy. Social media allowed me to bother my contacts. Twitter and email functioned too slightly differently. And telephone was the last resort medium. Using these all we gathered individuals who read a sonnet aloud WHILST recording themselves. What could go wrong? 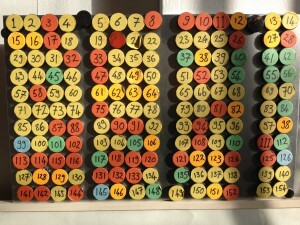 Naturally the idea started as 154 individuals. Shrank to 77 reading 2 sonnets each. And ended up as less than 77 with some reading 3 sonnets, others 2, and the odd one. 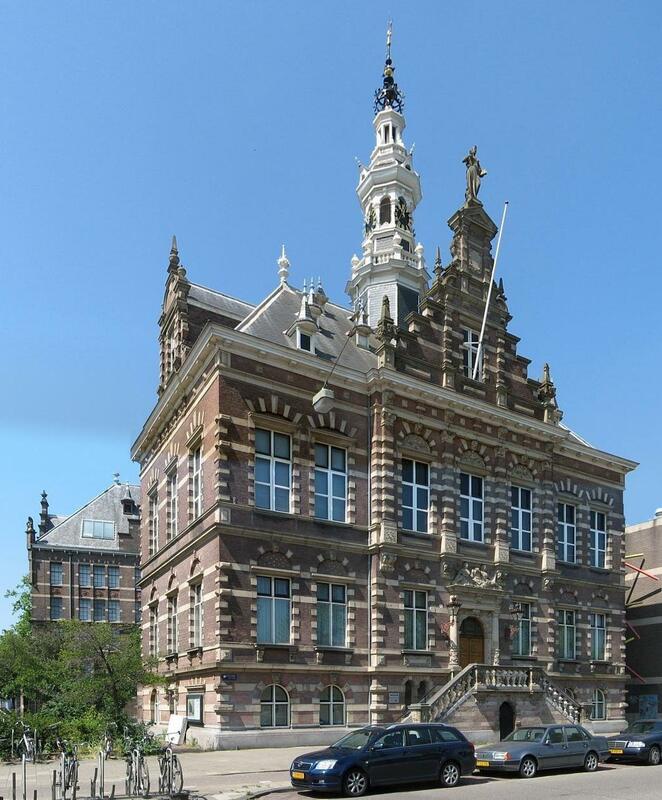 The location and start time fixed as 8pm assemble at Amsteldijk 67, former city archive building alongside the Amstel river. We rehearsed from 9pm until 9:40pm. The structure of the marathon would be 3 one minute blocks. The first sonnets 1-54, the 2nd 55-104 the 3rd and last 105-154. #154Sonnets3mins from william sutton on Vimeo. This film contains some of the films from 11 phones, or digital cameras of people within the storm. We have audio of the whole thing. We have footage and photos of the rehearsal madness. 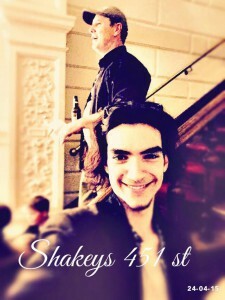 And some recordings from the SHAOKE sonnet show we performed around 10:30pm. My boy Liam recited his favourite sonnet 55. Devon G rapped us a sonnet or two too. Shakespeare’s 451st Birthday. So how will you be celebrating? There are hundreds of thousands of us Shakespeare enthousiasts out there in the wide world web. Several thousand refuse to accept that there’s a reason for celebration. We can ignore them until they arrive with real proof and not arguments all based around debasing our candidate. and on his burial 52 years later (25th April 1616: Will Shakspeare, Gent). That was his first taste of latin and being son of Chief Alderman John was entitled like all young boys to the free school at Stratford and a further latin education under the tutelage of Thomas Jenkins. But this post is about celebration not history. We will be doing the world’s quickest Sonnet Marathon on April 24th. This morning I took part in the English Breakfast show on local dutch radio. The link provides you with streaming capability to see and hear the last hour of the program. Vivaldi by Max Richter played to the Crystal ensemble’s Pericles in OP. 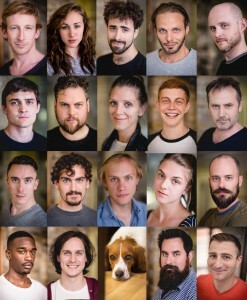 At the beginning of 2014 Ben brought his Ensemble together to raise a scratch 24 hr rehearsed reading of The Tragedy of Pericles, Prince of Tyre in Original Pronunciation, at the Jerwood Space in London, using a CD of Max Richter’s Four Seasons: Recomposed to underscore parts of the play. 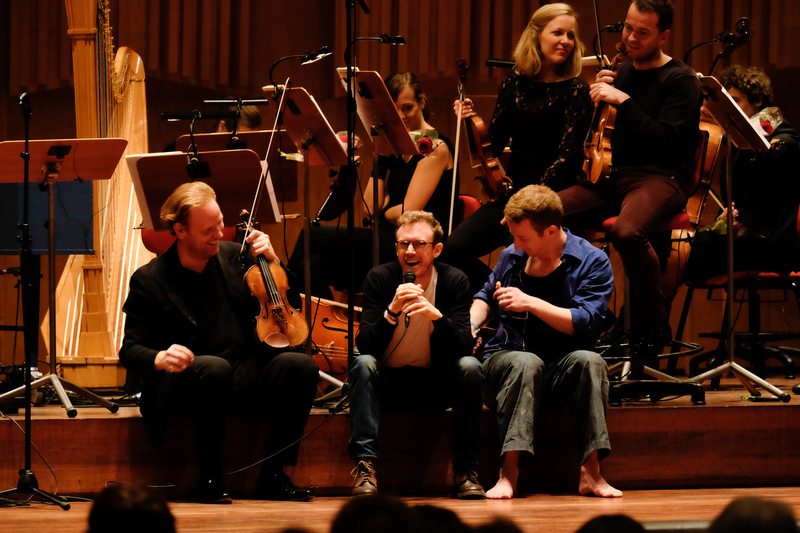 Here is a sneak-peak of, a year later, the co-production of Pericles: Recomposed with Daniel Harding’s Interplay Festival at the Swedish Radio Symphony Orchestra, Berwaldhallen, Stockholm, January 29th 2015. 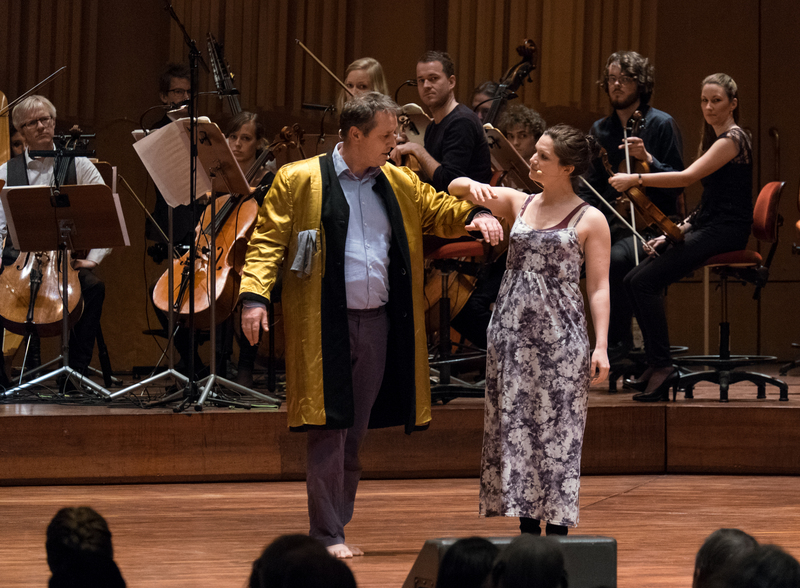 Bringing together his Shakespeare Ensemble from the UK, Europe, India, and the US, the company had two days of rehearsal before being joined by a Chamber orchestra, three hours before the performance. OP Jazz in the Big Apple. And…all things considered we learnt loads. (sic)? This post is a jazzed up recollection of things that happened. In the interest of closing one project before starting another. In the interest of recording the meeting between and memories created of actors that are more than just additions to social media. In the interest of brand new verbiage and methodological terminology; such as the contradictio in terminus, crescendo to the ground, or the alternative title for this post, banana contaminator. Above all in the interest of collaboration and British American Shakespearean relations. Our partners in discovery belong to the Shakespeare Society Ambassadors. and their respective photos and blurbs can be read if you click. Naming names: Maxon Davis, R.J. Foster, Shannon Harris, Montgomery Sutton, Claire Warden, and Will O Hare. 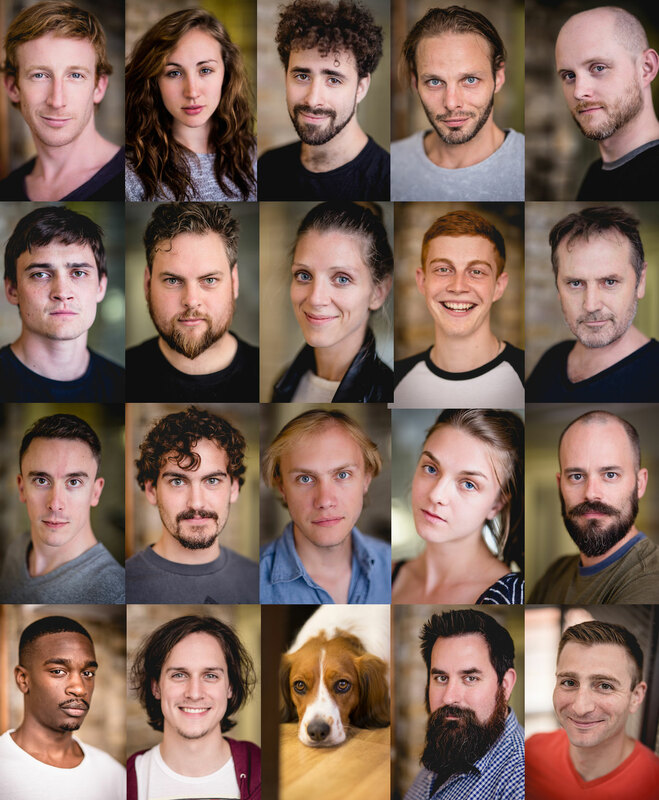 Plus Ian Petersen, and Sean Hagerty, ensemble member Adam Webb, and David Hywel Baynes, who not only performed as Richard 3rd at the Actors Church in London this last summer but also took all the photos you see below. I arrived in NYC on a friday after giving a school workshop at the AICS in Amsterdam Zuid an hour and a half before my plane left Schiphol some 10 minutes away. Warren Rusher our company manager met me at JFK and together we cabbed it to alphabet city. The ambassadors plus had been busy for 3 days already working their Original Practice with the Crystal ensemble core members Ben Crystal, Jenni Jackson, and Natalie Thomas. The saturday we met for a weekend of stick work in the landmark 1st presbyterian church at 12th and fifth. You know the feeling when you walk into a room full of people you’ve never met? And those people are all actors who DO Shakespeare. Every cliche response to work-shopping an ensemble is valid. Every nauseating luvvie reaction to bardolatry, each swollen ego…was absent. The experimentation with Original Practice took front and centre (center) stage. Each of us as core members lead our section of the workshop. Movement, sticks, voice, verse, and Original Pronunciation are the building blocks. Honest and open reaction and response required. The two days flew by, time expanded and shrank, and the collaboration grew. No imposition, no final solution, pure experimentation on a subject we all love. Always paying attention to the smallest aberration felt or heard or experienced and questioning it until satisfaction ensued. Unstructured structure. Social coalescence. Banana contaminator. All new terms for us that speak volumes to them as experienced. Experiential exploration. One might add as an after-thought. De-briefing as we go folks no final message here. Only a developing methodology. What will be its limits? 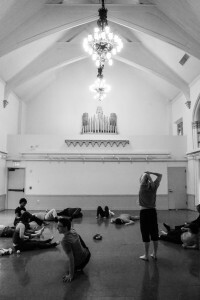 Open ensemble. Middle middle. 90% OP-10% you. Can any of these have limits. How open is open before it closes? How much more middle can you be without invoking the laws of physics? Articulatory percentages? don’t make laugh! The heart is a muscle capable of love. The proof lies in us. Truth for one isn’t truth for all. A body needing 8,000 calories a day is working hard at burning those calories. Or overloading its own system. One stop remedies are doomed to fail unless the individual system is ready to adapt the remedy to be its own cure. Personally cynical until convinced otherwise. Trusting others motives, kah! Hurt too many, too many times. Accepting of the guilt in mine own corner, or in the ring of our interaction. Unspoken fears can wreak more havoc than spoken desires, suppressed. That would be scanned. Is the outcome uncertain? Keep shtumm! Let it build until internal concern forces your hand. Idee fixe becomes group concern and everyone lends their balm to your cares. And time is wasted. Whether you waste time or it you, is immaterial. It’s gone and cannot be regained or refilled. Experience that this time around showed. Opening up to the primary impulse of fear lessens its growth by voicing an initial concern. Empathy and non-aloneness follows. Knowledge and learning. What do you know? How do you learn? How many calories is enough? The thing you need to learn, is it knowledge? Hung up on words. Words don’t define us. It seems strange that when we acknowledge people we define them by the words they say. And not by the deeds they do. Our time in NYC was about doing and learning. Our American counterparts whether true blue Texan, or Southern gent, or African American brother, or sister, or displaced Brit with a local partner; each has their own story, their own education in the bard. The Shakespeare voice knows no borders. That voice we all recognise as Shakespeare done bardly. Its opposite is a true voice speaking Shakespeare as if minted new. I observed professionally delivered Othellos and Edmunds and Constances regardless of who did the talking in whatever accent. The impact of adding OP was our point of exploration. And again that is impossible until there’s an ensemble to do the exploring. OP is a reconstruction, an approximation, a construct. So too we found are Received Pronunciation and General American versus one’s birth accent. The OP however is new old and lends Shakespearean verse an ear quite different to modern day dialects and accents with all our prejudices and preconceptions. That levelling of the Shakespeare playing field increases the likelihood it will catch on. Baltimore Shakespeare Factory is in the process of presenting a Merchant of Venice. GO hear the play if you can. This workshop could have been the be all and end all. But no. Ben was advertised as giving a talk at the Pearl Theatre on 42nd and 9th on the monday evening. A 300 seater filled with curious New Yorkers about to hear OP for the first time. Our thanks to the director and producers who allowed us to put on our show and tell session. 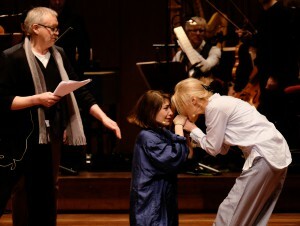 An interactive combination of sonnets and set pieces and free form was the result. The question and answer session revealing the excitement that OP generates in an audience. The reception on the upper west side was really icing on the cake. The dive bar we ended up in, poetic justice. And that was where the actors i worked with parted company. Yet for each one of those actors named, words cannot express the moments we shared. And that seems quite quite cliche ridden and wanky. All too too much. And yet as honest as any comedian’s roast. For that I thank you from the core. The wednesday we did a masterclass at the Ripley Grier studios. Ten new people to meet and share the lessons that we are still learning. A beautiful meeting for me with two sonnet aficionados, Brian Myers Cooper the sonnet guy who has 33 sonnets memorised by heart and Devon Glover the sonnet man from Brooklyn who is on 25 plus. That one day observed by Jennifer Geizhals. Participated in by a guy from Denver and a gal from Toronto and my sweetheart Sassy Smit from Amsterdam. That masterclass revealed jewels, which the future will display. NYC we will be back. Oh yeah, banana contaminator is the new iambic pentameter. Don’t let words obfuscate your meaning. 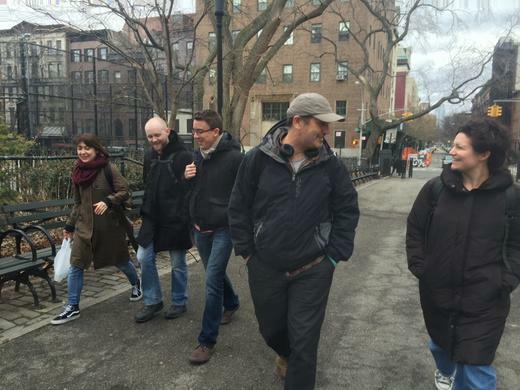 NYC – Masterclass in OP. The Crystal Ensemble core members will be doing their thing in NYC in March. The 16th March they present an evening of songs and sonnets and scenes in OP alongside a group of actors based in NYC. 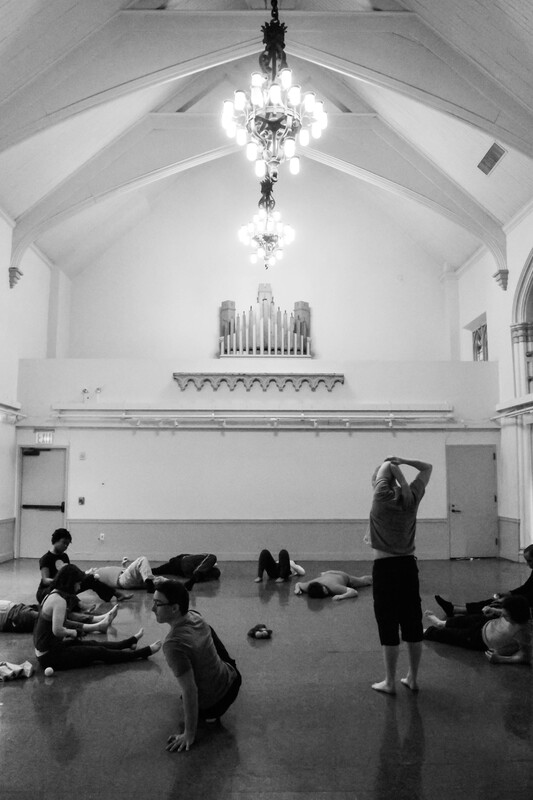 The 3 days prior to the show will be devoted to passing on the knowledge we have learned as an ensemble so far. It promises to be a fantastic experience in one of our favourite cities on the planet. Our host will be the Pearl Theatre. The 18th March we’ll be doing a one day masterclass for those interested in testing the methodology for themselves. Details are below and places are limited so book now. Who knows? Maybe we’ll meet in NYC in March. on scenes and speeches in Original Pronunciation. 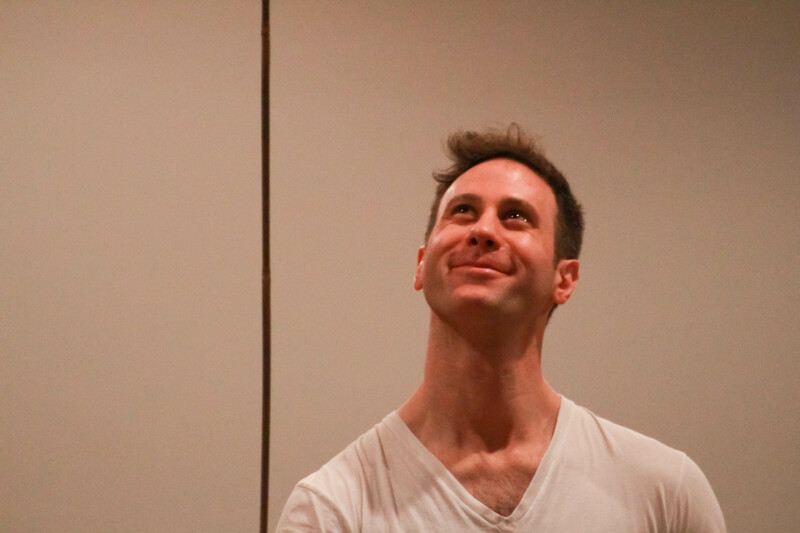 On Monday the 16th of March at the Pearl Theatre, there will be an evening Presentation of the scene work and a discussion of the joys, challenges and rewards of speaking Shakespeare’s words in the earthy and energized, salty and powerful accent of his time. Passion in Practice International Masterclass Series. Other ensemble members will also be present. Places on this workshop are strictly limited to 14 participants. ACCENTS OF THE WORLD-including Shakespearean!! Q1593 of Venus and Adonis. VANISH? Will he? Won't he? Q1609 Sonnets- Folger Library's Aspley (Jolley-Utterson-Tite-Locker-Lampson) imprint. Q1640 POEMS (Sonnets) by Wil. Shake-speare. Gent. Sonnet 145-Hathaway sonnet or Rap sonnet?